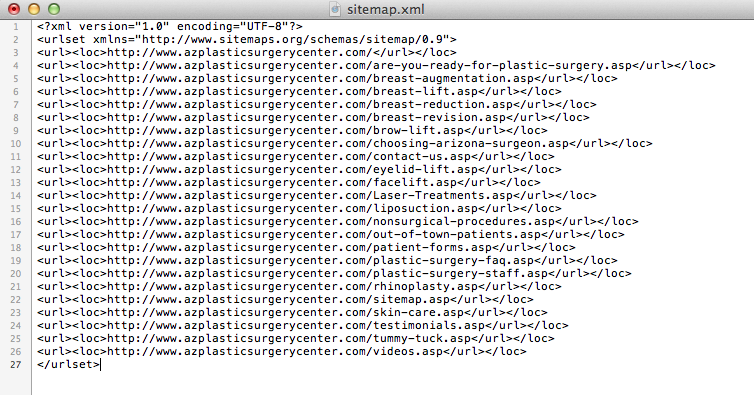 It’s no shock to SEOs that having an XML sitemap is an essential task on your to-do list. It gives you that one chance to whisper sweet nothings into Google’s little robot ears. “Sweet nothings” in this case being “all the pages of your website that you want to be crawled”. Many people choose to use an XML sitemap generator as a quick way to knock this off their to-do list. Pfft! Why not just do it yourself? 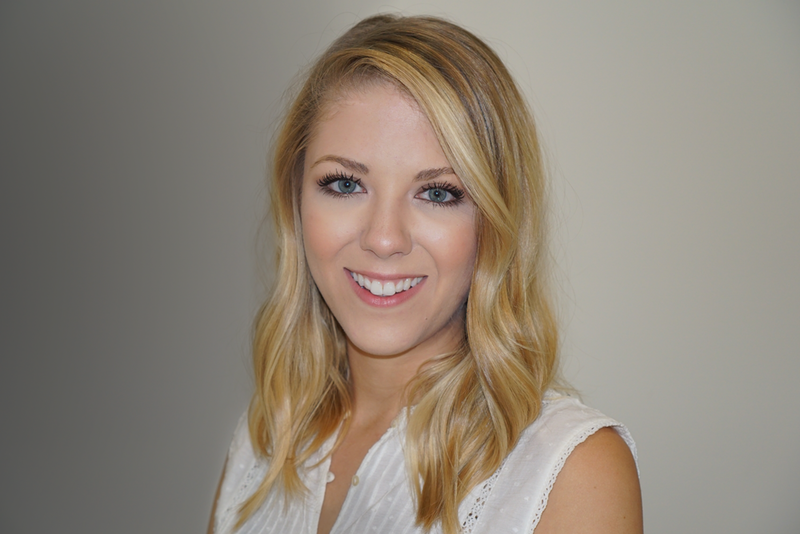 Who knows your site better than you? Knowing how to build one “by hand” is a great skill to have and I’m sure you’ll impress everyone at parties when you show them how (just kidding, please don’t do that). Note 1: this method is intended for smaller sites (<100 pages roughly) but is definitely scalable. Note 2: pay no mind to the example page names. That’s just what happens when you work for plastic surgeons. 1) Log in to your FTP client of choice. I’m using Transmit here. 2) Start with a clean slate. Be sure to rid the server of old files that either no longer exist or 301 redirect. You don’t want Google to get redirected or sent to a 404 page from your XML sitemap. Big no-no. 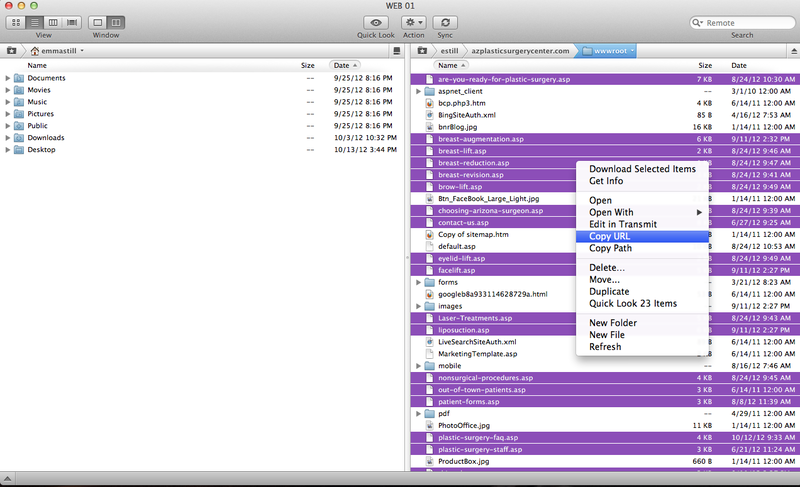 Select the files you’re including in the sitemap and copy them. Easy, no? Starting to look vaguely like a sitemap, right? Right. 6) Find and replace all the junk that you don’t need with all the junk you DO need. 7) Finally, add the fancy schema bits to the beginning and end of your sitemap, and save it as “sitemap.xml” to the root of the site. Let me know if you try this method and how it worked out! Wait, but what about priority, Emma?! Priority, schmiority. The point here is to keep it simple and clean. I’ll risk leaving out priority for simplicity’s sake since it’s optional, anyway. 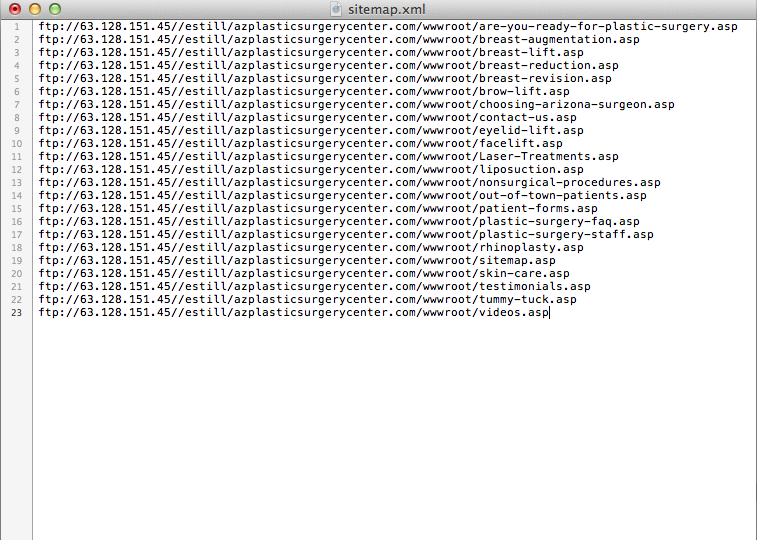 Feel free to wonder why I’m reading a blog post about XML sitemaps from over a year ago. I’m wondering about it, too. Lol. I’m actually super glad I read this. My jaw dropped when I realized you could just copy URLs out of FTP. That’s a great tip and something that I never would have though of. I usually rely on a crawler like Screaming Frog to grab URLs, but this is another great option. And yes, Screaming Frog would definitely be my option now- but this was a good solution 1) before I knew about SF and 2) when I was working on dinky little 50 page websites haha My, how fast we grow. Still glad you learned a little trick, though!